Regardless of firm type, business model or distribution channel, our industry is focused on “growth.” In pursuing growth – whether defined by AUM, net sales, endpoints, revenues, operating margins or any other metric – sponsor firms and asset managers are today navigating a wide range of disruptive forces. To drive growth in the face of these crosscurrents, a common denominator and focus have emerged. Across all segments of the industry, firms have zeroed in on transforming the client experience to deliver better outcomes, create competitive differentiation and propel growth. This year’s MMI Annual Conference takes an in-depth look at the innovative strategies, tools, and skill sets firms are deploying in this effort. From digitization, blockchain, and machine learning to alternative data, behavioral science, and client personas, our sessions will drill down on the ways the advisory industry is evolving and reinventing itself to improve client outcomes and the client experience. Underlying our discussions will be the critical themes of attracting and retaining next-generation talent, the imperative for professional development and leadership training, and fostering diversity and inclusion. Our three-day format means more sessions, more expert speakers, and more time to examine all dimensions of the Conference theme. The program mixes an exciting lineup of keynote speakers, general sessions, “Ted Talk”-style presentations and four specialized tracks on Day 2 to customize your conference experience. You’ll also have ample time to visit with your colleagues from across the industry at two special evening events – a cocktail reception and tour of The George W. Bush Presidential Library and Museum and the always inspirational MMI/Barron’s Industry Leadership Awards Dinner. Reserve your spot now to join a “who’s who” of senior executives from leading asset managers, sponsor firms, and solutions providers in Dallas for the investment advisory industry’s most important gathering of the year. We’ll see you October 15-17 in the Big D! The old asset management model is being disrupted, but so too is the trust and faith that citizens have in leaders and institutions across the globe. This confluence of factors presents both a rare challenge and a rare opportunity for the money management industry. Legg Mason CEO Joe Sullivan explains why industry leaders need to not only reinvent our business, but embrace a higher calling for why we are in it. With all the buzz about technology changing the way our industry does business, this session examines what is really happening on the front lines. What are financial advisors doing to leverage technology today, and what will it take to get them to connect all the technology dots in the months and years ahead? Our panelists are leaders at companies that support advisors and their clients by creating integrated systems and platforms that include financial products, software solutions, and platform technology. Hear firsthand about their efforts to build an ecosystem that enhances the advisor’s ability to provide personalized advice across an entire household portfolio, the challenges they’ve encountered along the way, and what they are doing to encourage advisor adoption. In this fast-paced session, two of our Annual Conference sponsors will offer quick-hitting "TED Talk"-style presentations that focus on timely topics pertinent to our conference theme. Prepre to be engaged and entertained! Trends Impacting Asset Managers - What Does it Mean for You? Each generation has its own quirks and predilections. That’s an important consideration for financial advisors, whether they are focused on working with millennial clients – or on attracting and retaining younger professionals as part of their practices. In this session, hear straight talk from a panel of millennial advisors on where they think advisors typically get it right in working with millennial clients and advisory team members and, more importantly, where they get it wrong. This session will provide valuable insight into how millennial advisory professionals are reshaping the financial advice profession – everything from the nature of that advice to how it is delivered to clients, and how it is paid for. In 1987, John O’Leary was a curious nine-year old boy. Playing with fire and gasoline, John created a massive explosion in his home and was burned on 100% of his body. He was given a 1% chance to live. His epic story of survival was first told in Overwhelming Odds, a book written by his parents, and that book encouraged Mr. O’Leary to embrace his miraculous recovery and share it with the world. Today, he is a bestselling author and motivational speaker, teaching more than 50,000 people each year how to live inspired. His emotional story, laced with unexpected humor and authenticity, is an inspirational reminder that our lives have much less to do with what happens to us, and much more to do with how we react to the circumstances we find ourselves in. ​In a wide-ranging discussion, Craig Pfeiffer and senior broker-dealer executives explore the converging forces reshaping the wealth management landscape. Topics include: the key challenges in positioning a firm for sustainability and long-term success, how firm value propositions and operating models must evolve as new forces come into play, attracting the next generation of talent to our industry, the steadily growing impact of data, and maintaining a client- and solutions-oriented focus. Many asset managers have dedicated tremendous resources to assist in the marketing of their products to financial advisors and end consumers. This session focuses on how effective those efforts have been and reviews proven ways for asset managers to help advisors overall while fostering greater distribution of their products. This session focuses on the suitability and supervision challenges of new product sets. Topics include: the introduction of new or different types of investment products within managed programs (hedge funds, private equity, annuities), including specialized advisory vehicles (fee-based structures) and associated supervisory considerations; developments in mutual fund share class selection and disclosure requirements; considerations related to similar strategies implemented through different structures (mutual funds, active ETFs, SMAs); and considerations when fulfilling the cash asset allocation within managed programs. Blockchain – Holy Grail or Overhyped? The term Blockchain has become ubiquitous in the financial press and at industry conferences. Is the attention warranted or is the hype overblown? This session surveys the current state of Blockchain usage in financial services, implementation successes and failures, and future challenges to adoption. Financial advisors face a host of daily challenges – wrestling with disparate systems, staying current with new products, and acquiring and nurturing new client relationships, to name a few. In this session, business leaders representing different sides of the advisory business focus on the tools their firms are developing to facilitate better client outcomes and advisor growth. The panel will also share their observations on the types of mindset and approach that help advisors achieve growth. This FA panel provides an honest appraisal of whether old school techniques – like cold calling and seminar marketing – still work. The group will share the new strategies and tactics advisors are adopting to grow their practices in an increasingly crowded marketplace. This session focuses on keeping pace with the rapid evolution of digital tools and new methods of communication. Topics include: the evolution in how clients and advisors communicate (texting, videoconferencing); expectations of the modern-day investor (virtual assistants, digital storage solutions, self-service); and privacy and cybersecurity concerns, including new regulations (GDPR). Demand for alternative investments has increased in recent years as investors seek new ways to achieve enhanced income and non-correlated returns. This session explores how the alternatives landscape has evolved, the operational challenges associated with alternatives, and how technology is making alternatives more accessible and transparent. This panel explores digital transformation – what it is, and how digital products and solutions are transforming the day-to-day experience for the investor, the advisor, and the home office. The expert panel will review the host of new tools, including robotic process automation, artificial intelligence, and blockchain and the distributed ledger, and provide a realistic assessment of their potential to drive efficiencies and enable growth. The industry has observed a marked increase in centralized decision making, including the growing use of model portfolios, which has been mandated by various advisor networks. This session examines how this trend is impacting intermediary sales and what a switch to marketing to the home office rather than individual advisors entails. This session provides an overview of relevant regulatory initiatives affecting investment advisers. Topics include: a discussion of the Regulation Best Interest, Form CRS and Investment Advisor Interpretive Guidance proposals; an update on SEC enforcement cases and e-delivery/e-signature regulations; an overview of regulatory actions and guidance regarding crypto offerings; an update on applicable state regulatory initiatives; and an analysis of the tensions between state and federal regulations. Today’s financial advisor must find scalable methods for delivering personalized experiences to clients while decreasing the costs of doing business. This panel reviews the evolving expectations of the modern-day investor, how advisors can use technology to drive growth, and the ways hybrid advice has helped many advisors reach new clients. This session looks at advisory product trends, with an eye to the hidden risks – and opportunities – you can’t afford to ignore. The panel will review the changing roles of ETFs, MFs, SMAs, UMAs and take a closer look at some of the new types of alternative investments that are worth a second look in today’s rapidly evolving product marketplace. Generation Next: How Will Our Industry Pivot to Meet the Needs of Younger Investors? The wealth management industry must reinvent itself to meet the needs of an increasingly diverse population. This expert panel looks at proven steps to enable diversity among the advisor population and what it will take to make our profession attractive to new, previously untapped, sources of talent. This session focuses on the evolution of the financial advisor’s role and the relevant regulatory initiatives affecting investment advisers. Topics include: an overview of goals-based planning and financial planning and the regulatory guidance relating to asset aggregation services; supporting a multi-generational practice; and considerations for millennial vs. senior clients. Product platform decisions have downstream impacts on technology and operations infrastructure. This panel will examine how back offices can best partner with diligence and business development teams to minimize time and effort in bringing new products to market. Is Your Advisory Platform Vulnerable to Market Volatility Risk? This panel will discuss platform risks tied to market volatility and possible approaches to reduce their impact. Specific topics include how well traditional alternative investments will hold up in a bear market, the ways that best-in-class advisors are reworking their portfolio risk management strategies, and why the emergence of hybrid robo-advisors is a plus. The panelists will offer advice on positioning your advisory business against these risks and taking advantage of new opportunities that emerge. Not a day goes by without a new announcement about the rapid rise of sustainable investing; the game board is set and the pieces are moving. But, with a larger sea change already under way in financial services, the raft of ESG developments are not taking place in a vacuum. Numerous forces – behavioral finance, changing demographics, a rethink of MPT, and technological innovation, to name a few – are converging. The implications for how the industry will approach client recruitment and retention, portfolio construction, and product distribution in the future are profound, and still coming into view. This session examines the emergence of sustainable investing in the context of the other major trends impacting financial services. Panelists representing different perspectives on the advisory continuum will weigh in on shifting client demands, emerging tools, and how big a force sustainable investing will prove moving forward. In this timely session, due diligence heads from different channels talk frankly about the evolution of the due diligence process at their firms, changing requirements and hot spots, and what they are looking for today in manager and fund candidates. Discussion topics include: the trends and sectors getting their attention in this later stage of the market cycle, the changing fee landscape and how it plays into evalutions, how the ability to get similar exposures across different types of investment vehicles impacts the process, and the top challenges research teams face in dealing with fund managers. In this fast-paced session, two of our Annual Conference sponsors will offer quick-hitting "TED Talk"-style presentations that focus on timely topics pertinent to our conference theme. Prepare to be engaged and entertained! Conceptually, it’s easy to agree that attracting, engaging, and inspiring diverse talent – and different ways of thinking – are critical to the future of our industry. Putting this theory into practice isn’t as easy. This session will provide a leadership perspective on the practical realities of building and retaining a truly diverse workforce in today’s rapidly changing financial services marketplace. The panelists will share their personal experiences, offer a candid assessment of the relevant issues, and discuss the strategies that forward-looking firms are employing to move the needle on diversity and build a “future-ready” workforce. The U.S. women's hockey team won gold in PyeongChang in a thrilling 3-2 shootout victory over archrival Canada. The win ended 20 years of frustration on the Olympic stage for the U.S. women and provided sweet redemption after what was viewed as a collapse four years earlier in Sochi. Along the path to gold, the women overcame not only the weight of expectations, but a variety of other challenges, including a gamble to achieve equitable support, a move to Tampa, Florida which started with riding out a hurricane in a hotel lobby, and the complete turnover of the coaching staff. Members of the team will share the inspiring story of how they bounced back from defeat, overcame obstacles on and off the ice, and persevered as a team to cement their legacy. This track focuses on new paradigms and practices in the distribution of investment advisory solutions. Topics include: the most effective ways to market to women, Gen Xers, and millennials; innovative approaches to attract and retain top talent; why diversity and inclusion make good business sense; success secrets from top advisors; using social media to reach the right audience; how centralized home-office decision making and the increasing use of model portfolios are changing the way asset managers approach intermediary sales; and what lies ahead for load funds, actively managed products, fund pricing, and direct to consumer sales models. Attendees will understand the forces reshaping the distribution of advisory solutions and hear first-hand from sales and marketing pros at sponsor and asset management firms. This track focuses on the most significant regulatory and compliance issues affecting investment advisory solutions from both the sponsor and asset manager perspectives. Topics include: keeping pace with the rapid evolution of digital tools and new methods of communication; the latest developments on the regulatory front including Regulation Best Interest; the suitability and supervision challenges of new product sets; privacy, cyber security, and GDPR considerations; and compliance practices and the “next generation” financial advisor. Attendees will gain practical insight and takeaways from CCOs, industry consultants, and business experts who are on the front lines navigating these challenges every day. This track examines the ways that new tools and technology are shaping the future of asset and wealth management. Topics include: harnessing potentially disruptive technology to drive growth; an update on the progress and use cases for the industry’s adoption of blockchain; how technology is reinventing the marketing, evaluation, purchase, and maintenance of alternative investments; the downstream impact of DOL, MiFID II, GDPR, and PSD2 on advisory technology; how successful advisors are leveraging the latest tech tools to meet changing investor expectations; and minimizing operational friction between distribution/product and TechOps teams. Attendees will gain a deeper understanding of emerging technology tools and hear firsthand from experts at asset managers, sponsor firms, and leading solutions providers how they are leveraging these innovations to create efficiencies and growth. This track focuses on major factors influencing the future of product development for both asset managers and sponsor firms. Topics include: the products and solutions advisors are looking for to kickstart growth for their practices; a survey of the new types of vehicles, strategies, and pricing structures that are emerging; how technologies like AI and machine learning are impacting the investment process; how leading asset managers are harnessing data of all types to gain a competitive edge; and what you need to know about cryptocurrency. Attendees will get an in-depth look at the latest trends in advisory product development and what’s on the horizon. We are pleased to announce an exciting lineup of Sponsorship and Exhibitor opportunities. The Annual Conference is the only MMI conference with an exhibit hall this year - and space is limited. We expect the Sponsorship and Exhibitor opportunities to be spoken for quickly, so please act now to reserve your spot. Representatives from over 210 distinct organizations - a diverse collection of asset managers, distributors, and solutions providers -- attended last year's Annual Conference. MMI attendees are senior business leaders responsible for developing, managing and distributing investment advisory solutions platforms and services. They are a highly engaged group of decision makers who drive purchase decisions. For Sponsors and Exhibitors, that's why the 2018 MMI Annual Conference represents a truly unique opportunity to build brand awareness, showcase your firm's offerings, and make new connections. To cap off day 1, join your colleagues for a special evening reception at The George W. Bush Presidential Library and Museum. Located in a beautiful urban park on the campus of Southern Methodist University, The Library and Museum provides an unmatched resource for the study of the life and career of the nation's 43rd President. We will enjoy cocktails in the stunning Freedom Hall and tour the interactive exhibits, which include a full-size reproduction of the Oval Office. This is a rare opportunity not to be missed! Join us on Tuesday, October 16th for the 2018 MMI/Barron’s Industry Awards Dinner, where we will present our annual awards recognizing achievement and innovation in investment advisory solutions. We will also honor the 2018 MMI Advisory Solutions Pioneer - Jim Tracy, Head of Consulting Group and Practice Management at Morgan Stanley Wealth Management. In addition to recognizing outstanding industry performance, this festive evening will serve as a fundraiser for the Gateway to Leadership Foundation - MMI's workplace diversity program. Individual tickets can be purchased as part of your Annual Conference registration, and multiple tickets and tables can be purchased by calling MMI at (646) 868-8500. Individual seats are $350.00 per person, and tables for eight are available for $2,700.00. As Gateway to Leadership is a 501(c)(3) charity, $175.00 of the individual seat fee and $1,300.00 of the table fee are tax deductible. Due to the charitable nature of the event, no refunds will be granted for cancellations. However, you may transfer your registration to another individual without penalty. To cancel or transfer your registration, please contact MMI at 646-868-8500. Investments & Wealth Institute® has accepted the 2018 MMI Annual Conference for 8.0 hours of CE credit towards the CIMA® and CPWA® certifications. 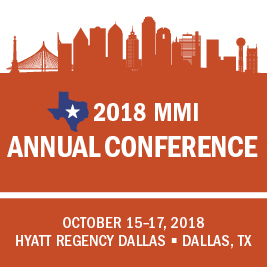 Please follow this link to reserve a room under the MMI room block or call the hotel directly at 214-651-1234 and request the Money Management Institute rate. The discounted rate is $239/night (plus taxes and fees). The rate as of 9/27/2018 is $299.00 or $309.00 (plus taxes and fees). The rate as of 9/27/2018 is $299.00 (plus taxes and fees). The rate as of 9/27/2018 is $349.00 (plus taxes and fees). A 10% discount off of the Standard Rate is available for additional participants from the same firm once two participants have enrolled at the full conference rate. Please contact MMI at 646-868-8500 for the discount code. All cancellations are subject to a $50 cancellation fee. Full refunds minus the $50 cancellation fee will be granted for cancellation requests received prior to 5:00 PM ET on Friday, October 5th. After that time, no refunds will be granted. Your registration can be transferred to another individual at your firm without penalty. To cancel or transfer your registration, please contact MMI at 646-868-8500.